WIP: Striped Pullover | Stitch, Brinn, Stitch! So I have not been blogging as much as I would like. Part of that is that I was sick in the middle of this week and wasn’t sleeping (four hours of sleep over two days is… fun. Not. ), but also I’ve not quite settled into the swing of things back at school, and once I do, it’ll be easier to blog more often. The darker swatch was knit it Malabrigo, so it’s more like in return for a shawl pin and a bit of yarn, I got to knit with Malabrigo, which is almost just as much of a reward as the first two things. I’m up to some waist shaping at the moment. 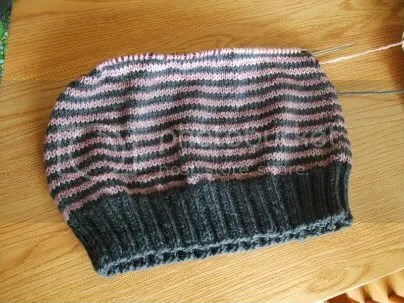 It’s working up at a fair clip–worsted weight and two-row stripes will do that. I think I’m going to love it when it’s done, thought I still haven’t decided if I want to .do a v-neck or a scoop neck. I’m currently leaning toward scoop (I do love me a good scoop neck), but I could still be persuaded otherwise. I also just finished up a swap, but I’ll talk about that another time so I can show you all the pictures for it at once. I also think I’m doing another WWFY swap (involving WOLLMEISE, which I’m pretty stoked about), so that’s pretty exciting. 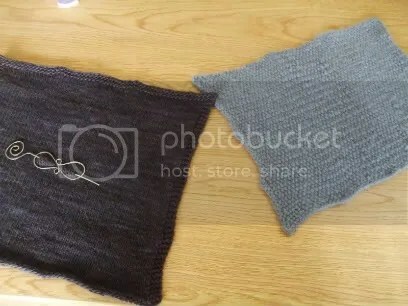 I have lots of things planned for the near future (birthday present for boyfriend, capelet that I’m designing as part of a Halloween costume (and also just to wear) but for which I also have to dye some yarn). Stay tuned!